Pictured at the Camogie Association Volunteer and Media Awards in Croke Park on Saturday night were, L to R: President of The Camogie Association, Kathleen Woods presenting the Mick Dunne Local Media Award to Tomás McCarthy and Ger Lawton (Waterford News and Star). Also included is Una Dunne. Photos: INPHO/Oisin Keniry. 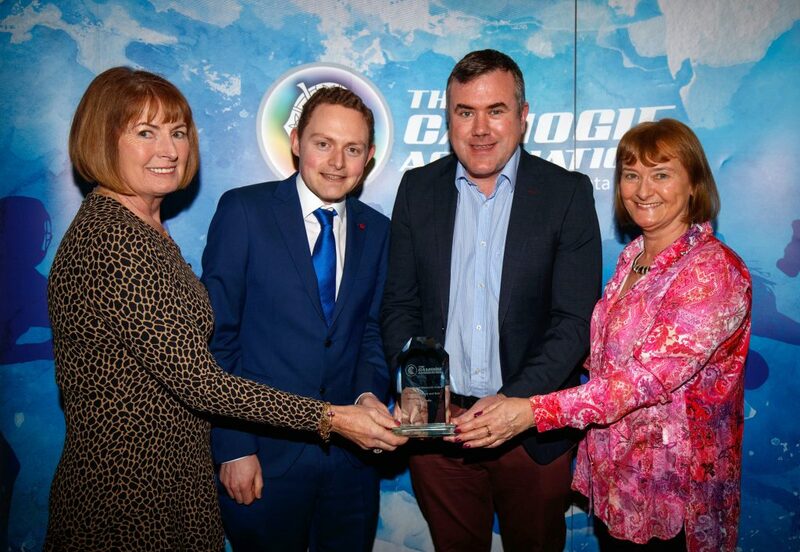 Waterford Sport, the sports supplement of the Waterford News & Star, was honoured with the Mick Dunne Local Media award at the Camogie Association 2018 Volunteer and Media Awards at Croke Park on Saturday night. This is the 13th year of the camogie association awards incorporating the Mick Dunne Memorial awards. Mick Dunne made an outstanding contribution to the coverage of Gaelic Games, particularly camogie. He gave the game extensive coverage in print as well as on radio and television and the Waterford News & Star was honoured for the coverage that we gave to camogie in 2018 both on the local club scene and the Waterford inter-county teams. 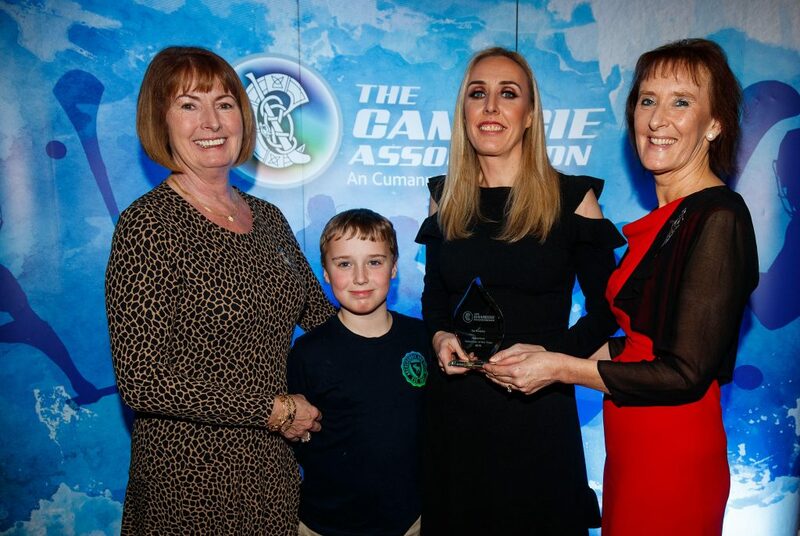 Sports Editor, Ger Lawton and our camogie reporter Tomás McCarthy were in attendance at the packed function in the Cusack Stand, Croke Park to receive the award from President of The Camogie Association, Kathleen Woods and Una Dunne, daughter of the late Mick Dunne. Una’s sister, Eileen Dunne of RTE news was the excellent MC on the night, while their other sister Moire and their mother, Lilly were also present on the night as special guest of the camogie association. As well as the various media awards, 28 grassroots camogie volunteers from all over Ireland and Britain were rewarded for the great work they do for the association, week in week out. Among those honoured was Waterford County Board chairperson and De La Salle club stalwart Ita Murphy. We were thrilled to awarded with this prestigious award which is recognition for the wonderful year that Waterford camogie enjoyed in 2018, as they qualified for the knockout stages of the senior championship for the first time and the minors won the county’s first ever A title at the grade when they defeated Cork in Fermoy. St. Angela’s Ursuline also won two All-Ireland schools camogie titles in 2018. These were just some highlights of a brilliant year that also saw De La Salle’s Beth Carton win Waterford’s first ever senior All-Star. Personally, I would like to thank Tomás McCarthy for his excellent reporting on Waterford camogie both locally and on the inter-county stage. Also thanks to Ita Murphy and all involved in Waterford camogie for their nomination and their help and assistance. Thanks too to Noel Browne for his superb photographs and our News & Star colleagues, especially in our production department. Here’s looking forward to another great year for Waterford camogie in 2019. That looks assured with the start that has been made so far, with Gailltír qualifying for the All-Ireland club intermediate final and St. Angela’s Ursuline winning the Munster A title recently and now heading to the All-Ireland semi-final and hopefully final. You won’t miss any of the action right here, in Waterford Sport in the Waterford News & Star. President of The Camogie Association, Kathleen Woods and Moire Dunne present Ita Murphy of Waterford with her volunteer award. Also included is Ita’s son Darragh.